This collection of Ramayana Quotes is mainly from books and the holy epic Ramayan. The quotes have been collected over a period of 10 years from talks, books, magazines and newspapers. No man has ever born who could conquer old age. The body is like a leaf. In no time, it yellows and drops to the ground. The retreat of a strong man is like the silent drawing back of a fist to strike a blow. Man should devote himself to dharma and only to dharma. One who sets his mind, instead, on acquiring Artha (wealth) becomes an object of the censure of the wise. The third man who is lost in Kama, the other path, is not worthy of praise. If, however, a man follows the path of dharma set down in the Shastras, Artha, Kama and Moksha will follow as a natural sequel to one’s actions. Some happenings in the life of man cannot be explained away, and the course of some things can never be altered by anyone, however much he may try. Anything which has been begun in good faith does, at times, get obstructed in its course, and takes an unexpected turn and that is the work of Fate. It does not matter whether you are a man or a woman; your caste, name and position are not taken into account…Devotion is the only thing that is essential to worship the One. When you truly understand that the Atman, which is your true Self, is without any attribute or attachment, you should give up your identification with your body which is inert and impermanent. So seek the true nature of Atman. Don’t you see the great sky reflected in each and every lake or river? Paramatman is the sky which is stationary. Its reflections are not permanent… Paramatman, which is the Brahman, is the only reality. All the visible living things are only its reflections. A first class leader does not make a decision without consulting, with open mind, wise experienced ministers, friends who have been faithful throughout life and family members who have proven their love and after taking that council and seriously considering every word of it depending upon the higher power of God or providence for right direction. A second class leader with his own intelligence searches his own heart what’s best to do and then after considering everything takes full responsibility. A third class leader is one who hastily attacks or does something serious without due consideration of the pros and cons. In the battle, the virtuous are empowered to have ultimate victory and the sinful are doomed to defeat. Sita is like a serpent; Her charming smile her fangs; Her shapely form is her coils; Her caste faithful love for Lord Ramacandra is like the venomous poison that is going to be the cause of your death. Give up Sita and live. 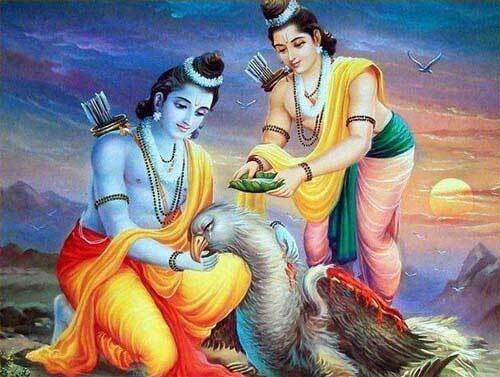 By fighting with Rama you are putting a noose around your own neck. That man is a saint who remains unaffected by praise or criticism. Saint is like a mine of virtues. It will always be easy to get people who talk pleasantly, oh, king, but it is impossible to get them who talk judgmentally and give suggestions. These suggestions may not be pleasing but will gradually solve the problem. And it is impossible to get listeners to such advises. Desire, passion and the like are the enemies. Of these passion is alone capable of impeding the path of emancipation. Under its influence man kills fathers, brothers, friends and those who are attached to him. All mental fever has its root in passion. Passion is the great cord that binds the world. Passion is the destroyer of virtue, do thou therefore relinquish passion. Take thyself to forgiveness, thus thou shalt have no enemy. Different from the body, the organs of sense, the life breaths and the intellect, self effulgent, unchangeable is the pure formless atma (self). So long as people do not know the self to be distinct from the body, the sense organs and the life breaths, they are troubled by worldly sorrows and are under the influence of death. Do thou therefore always contemplate in thy heart upon thyself as distinct from the body. These advices were given by Bhagavan Sri Ram to Lakshman when an angry Lakshman wanted Sri Ram to give him permission to defeat Bharata and his mother Kaikeyi. 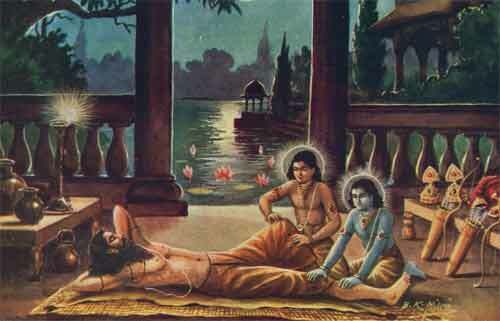 These incidents happened when Lakshman heard that Sri Ram was asked to go into exile. Like a flash of lightning in a mass of clouds unstable are all worldly enjoyments. Life is also like a drop of water upon a piece of heated iron – liable to disappear any moment. Like a frog hanging in a serpent’s throat being yet desirous of eating the serpent’s flesh with his teeth, men of the world are desirous of enjoyment of unstable worldly objects, even though they are being swallowed up by the serpent of time. Fickle like a shadow is fortune, unstable like the waves of the ocean is youth, the pleasure derived from the company of women is like a dream, life is short and yet embodied beings have so much attachment to these. I am this body. The notion is called avidya. I am not this body but the intelligent self. This is called knowledge. Avidya is the cause of the world, knowledge of self destroys impressions created by Avidya. Those desirous of emancipation should, therefore, always strive for the acquirement of knowledge of self. Devotional love for union with the Supreme. Bhakti has three different aspects according to one’s individual nature. He who worships Me to bring harm to anyone or out of hypocrisy or envy, or is wrathful or harsh or is unkind to others, is drowned in the mode of darkness. Situated in the mode of passion is the person who, thinking of Me (Bhagvan Sri Ram) as a distinct entity, worships Me through an image for some temporal benefit, or is after sensual pleasure or wants money or fame. The person who works for God with the conviction that right actions ought to be performed and offered to the Lord, is a devotee in the mode of brightness. Like the Ganga waters joining the sea and getting mixed with the sea waters, the constant immersion of one’s mental waves in Me (Bhagvan), the fountain of endless virtues, is the pure Bhakti Yoga. Bhagavan Sri Ram: In this world there are three types of followers. The best of the them carries out the work allocated to him by the leader, and goes even farther and, creatively anticipating the leader’s wishes, fulfils them too – yo hi bhrityo niyukttah san bhartraa karmani dushhkare; kuryaat tad anuraagena tamahuh purushhottamam. The mediocre follower does not, though capable, do anything more than what the leader commanded him to do – yo niyuktah param kaaryam na kuryaannaripateh priyam; bhrityo yuktah samarthashcha tamaahurmadhyam naram. And the worst follower is he who though capable, does not even carry out the leader’s wishes – niyukto nripateh kaaryam na kuryaadyah samaahitah; bhrityo yuktah samarthashcha tamaahuh purushhdhamam.